An Intelligent Horsemanship 20ft lead line. It means no more dangling on the end of a 2ft lead rope or tripping over the loops of your long lines when leading. The 20ft lines are perfect for leading your horse in any occasion, including when doing groundwork. They are light, strong, durable and give you that extra piece of mind when leading because the extra length just gives you a bit more line to hold on to, without having to worry about lots of rope in your hand. 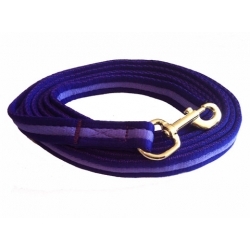 20ft Intelligent Horsemanship lanky lead lines are easy to use and excellent value for money!